Once Avengers: Endgame hits theaters next month, the Marvel Cinematic Universe is expected to head into a sort of brave new world in terms of storytelling. And according to a new report, we might know who one of the franchise's newest stars might be. According to a new report from Variety, Florence Pugh is in talks to join Scarlett Johansson in the upcoming Marvel Studios project. While details about her character are not revealed in the report, Pugh's role is described as a "second lead" role. Pugh is best known for playing Saraya "Paige" Knight in this year's Fighting With My Family, as well as appearances in Outlaw King and The Commuter. She is next set to star in Midsommar, as well as Greta Gerwig's remake of Little Women. Pugh was previously listed in the shortlist for this mysterious role, with Harry Potter alum Emma Watson believed to be the front-runner earlier this month. Other actresses who had reportedly been in the running include Alice Englert and Dar Zuzovsky. The Variety report reveals that Marvel Studios had "zeroed back in" on Pugh after meeting with other actresses, after she had earned strong reviews for Fighting With My Family. 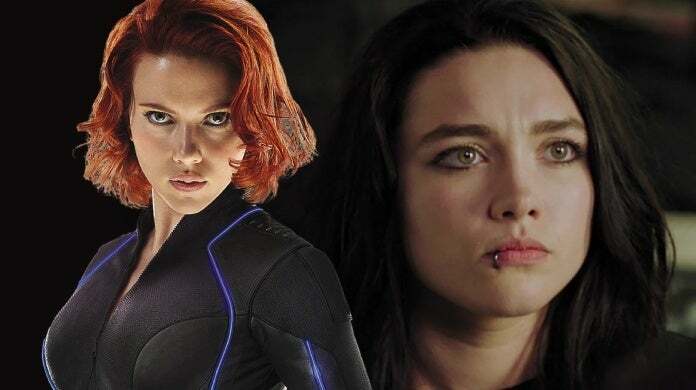 After years of fans campaigning for a Black Widow movie, the project was officially put into development in January of 2018, with Cate Shortland directing and Jac Schaeffer co-writing. At the moment, it's unclear if the project will be set before or after the events of Avengers: Endgame, but it sounds like Johansson is more than aware of the possibilities surrounding the solo movie. "It's such a loaded question," Johansson said during a recent interview. "Yes, I would want to in the right context and for the film to fit where I'm at, where I am in my life. I mean I've played this character for a long time. It's been probably like 8 years or more, and so much has happened in my life, my life as a performer and happened in my life personally." "I love playing this character." Johansson continued. "And I think there is definitely an opportunity to explore the Widow as a woman who has kind of come into her own and is making independent and active choices for herself probably for once in her life. You know she hasn't always had that possibility so if it fit that criteria then yes I would want to do it." What do you think of Pugh joining Black Widow? Share your thoughts with us in the comments below! Captain Marvel is in theaters now. It will be followed by Avengers: Endgame on April 26th, and Spider-Man: Far From Home on July 5th.